As I sat out in a sheltered corner last week, eyes closed and face upturned to the sun, I realised it was here. Walking season. Over the past two years weâ€™ve had some amazing adventures all around this small isle, and the more we see the more we want to share it and encourage people to also respectfully enjoy it. However, we do also realise that quitting jobs and living on the road (eating far too many packets of instant noodles and drying socks on in the wind) isnâ€™t for everyone. What might interest people out there, are the many many amazing walking festivals that are popping up all over the country. The only walking festival weâ€™ve attended (so far) was the Croagh Patrick Heritage Trail Walking Festival, and we had a ball (especially because we got to sleep in a handball alley for the weekend!). So hereâ€™s a list of festivals that Iâ€™ve found through a bit of searching, and from some wonderful people out there on social media who sent me names and links for different places! 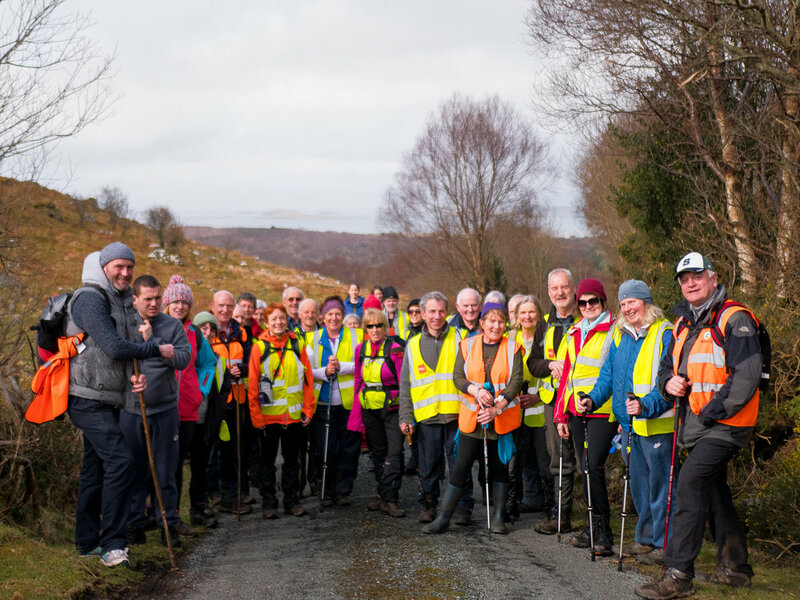 Suil Eile has the great tag line of â€œWalking with friends - Step in, Surprise yourselfâ€� and was designed for local communities to live quality healthy lives, socialise together and to combat rural isolation. Last year their walking festival was based from the village of Clogheen, which at the foot of the Knockmealdown Mountains. 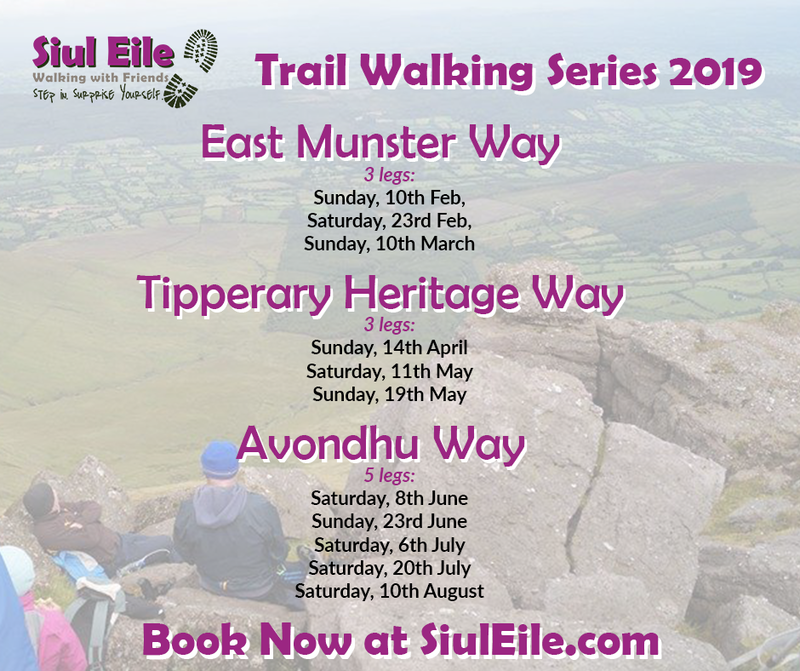 Clogheen is also the junction to three major National Waymarked Trails: the Tipperary Heritage Way, the East Munster Way, and the Avondhu Way, and so this year, instead of a walking festival over one weekend, Suil Eile have organised a walking series that covers all three of these trails! As I write this, their walk along the East Munster Way is coming to an end, with the Tipperary Heritage Way trail starting on the 14th April. The walks are spread out across one or two days per month, so thereâ€™s no large time commitments and plenty of rest time in between! The tickets are â‚¬35 per day, with discounts if you book a full trail or early bird tickets! For more details on all of the above, see their website. The walking festival in Westport is for the more vertically inclined! Theyâ€™re hiking the highest peak in Connaught, Mweelrea (814m) on the Saturday, followed by Leenane hill (730m) in County Galway on the Sunday (they do mention that â€œthe walk days are interchangeableâ€�, depending on weather, etc.). Walking tickets are priced at â‚¬65.00 for two days or â‚¬35 for one day. They also have ticket options that include B&Bs/accommodation, check out this website for more details. The Kerry Camino takes you from Tralee, through Camp and Annascaul to Dingle (we walked it as part of the Dingle Way), and on this coming May bank holiday youâ€™re invited to â€œwalk in the footsteps of St. Brendan, the Navigator, as a walker or pilgrim, on this journey of contemplation and fun.â€� Itâ€™s a beautiful trail, and the community that are involved in promoting and maintaining bring amazing information and passion! Tickets vary from â‚¬10-â‚¬80, hereâ€™s a link to their website, and to eventbrite for tickets. Formally known as the Leenane Mountain Walking Festival, the festival takes plaec in the village of Leenane, which is situated on the edge of Killary Harbour and surrounded by mountains in all directions. (We walked through it on the Western Way!) This May will be the 11th year of the Connemara Mountain Walking Festival. Hereâ€™s a link to their website, and hereâ€™s a link to the Schedule PDF! Cavan Walking Festival is possibly the longest walking festival Iâ€™ve found happening this year, taking place over eight days! From 3rd to 10th May, the festival includes trails, rambles and hikes all led by local trained guides. 2019 is the ninth year of the festival, which takes place at a variety of locations throughout County Cavan. Walkers can choose from Geopark walks, night, nature, forest and history rambles, heritage, family and fitness trails and atmospheric dusk walks, along with a hike on The Cavan Way! This year is the 25th Anniversary Slieve Bloom Walking Festival! The Festival takes place in spring every year as the bluebells come into full bloom. The festival offers a choice of woodland walks, riverside and gentle rolling hills with experienced walk leaders who will enhance your hike with stories of local history, geology and fauna. As well as more strenuous hikes over some difficult terrain from Clonaslee we have included some extra special walks take place this year. These include family friendly walks with Alpachas, a photo walk with the award winning photographer Paul Moore and for the more experienced walker who doesnâ€™t mind getting their feet wet a Geological Odessy in the Silver River with John Feehan. Festival Weekend tickets are â‚¬20 or â‚¬8.00 per walk. For more details, and chances to book tickets, check out their site. The Rosses Walking festival is offering wonderful guided walks along the some of the most glorious parts of the Rosses on the Wild Atlantic Way. This is the 3rd Annual Rosses Walking Festival, and will be held across 6 different venues in the Rosses. Walks for all ages and abilities, with all walks â‚¬10 per person - this includes a guided walk, transport, refreshments and entertainment. Tickets may be purchased online on eventbrite or at the Ionad Teampall ChrÃ³ine in Dungloe. Below is an overview of their walks! To find out more information about this weekend walk, check out their eventbrite page. Tickets range from â‚¬5.85 - â‚¬22.20. In summer 2018 the inaugural â€˜Rhododendron Walking Festivalâ€˜ took place along the tracks and trails of the Knockmealdown Mountains and surrounds. The event was a huge success and will be held again in 2019 over the June Bank Holiday Weekend (May 31st, June 1st, 2nd & 3rd). There are three tiers of walking scheduled, as well as Fun days and comedy dining experiences. For more information about the walks scheduled for each day check out www.vee.ie, and you can also keep up to date with the Rhododendron Walking Festival at the Facebook Page â€“ Facebook.com/VeeWalks. or via the Twitter account at Twitter.com/VeeWalks. Tickets for the weekend range from â‚¬5 - â‚¬35. The Mourne International Walking Festival has been running for many years. Most walks start in the town of Warrenpoint, with all walks graded at different difficulties to ensure people can find something to suit their level. The social highlight of the weekend is the aptly named â€˜Blister Ballâ€™, an evening of ceili and set dancing to traditional music with a hot buffet supper. Previously, tickets have started at one day tickets Â£6/â‚¬10, two day ticket Â£12/â‚¬15, three day ticket Â£15/â‚¬20. Currently fully booked, the route in the past has been a 28.2km hike, from Mount Brandon to Annasaul, with a total ascent of 1,747m. If youâ€™re interested itâ€™s still possible to add your name to their waiting list, just check out their website. I havenâ€™t found any details about this years festival, but Iâ€™m sure when thereâ€™s information youâ€™ll be able to find it on their facebook page. As I write this (check update date!) I donâ€™t have any specific details for this years festival apart from the dates, but hereâ€™s a link to the festivalâ€™s website, and hereâ€™s a link to their facebook page. Located in the Sperrins and Killeter regions of Co. Tyrone, there is an amazing amount of beauty and heritage to explore! Details havenâ€™t been announced for this years walking festival, but in the past they have catered to all varieties of level, from easy strolls to challenging hill walks. Thereâ€™s not much information out there yet, so hereâ€™s what was on last year, and when there are details theyâ€™ll be on that site! Based in Stranorlar in Co. Donegal, the Twin Town Walking Festival offers a huge range of walks and outdoor activities for walkers of all levels, and families of all ages. 2018 was the first year of the festival, and included nature trails, adventures in the dark, historical walks, and open air painting! To keep up to date with festival announcements, check out their facebook page, and follow Wild Days Out for all things walking in Donegal! The Festival will be based in the Brockagh Resource Centre with many of the walks taking us through Wicklow Mountains National Park (the Centre is situated in the heart of the Wicklow Mountains, on the road between the village of Laragh and Glendalough). All walks are led by experienced walking leaders who will enhance your day with information on local history flora and fauna. Climb Leinsterâ€™s highest peak, Lugnaquilla (925 m). A night walk on Friday the 25th promising to be a unique and adventurous experience. A selection of day walks from challenging, moderate and easy on Saturday and Sunday. A moderate walk on Monday the 28th to celebrate the completion of a great weekend and summer walking season. Hereâ€™s a link to the website with lots more details of the walks they have planned! The Anascaul Annual Walking Festival is happening on the October Bank holiday weekend. Currently I donâ€™t know many of the details, so here are the links to their website and their facebook page! This wonderful weekend, now in its 26th year, offers some fantastic walking, great talking, excellent local guides and the company and camaraderie of like minded friends. Check out their website for festival updates. Once there are details youâ€™ll be able to find them here! A week after my sunshine epiphany, Iâ€™m cycling through Dublin and my face is stinging from the ridiculously intense rain. My short cycle becomes a long one as I have to slow down because my breaks are too wet to do anything, and my hands are too cold to pull on them anyway. I curse the sky, remember my thought about walking season having arrived, and laugh at myself. Needless to say, no matter what time of year you go hiking in Ireland, youâ€™ll probably miss all the weather you thought probable, and walk straight into the impossible. If thereâ€™s a festival we didnâ€™t find, leave a comment below with the details and weâ€™ll add it in! If you like our blog you can subscribe to it here!